As we enter the Arcola main stage, we are presented with a hotel room in midtown Manhattan circa 1954. Albert Einstein sits on the bed going over some notes on his legal pad. He is interrupted by the arrival of Senator McCarthy who wishes him to testify before the House of Un-American Activities Committee, which is something that Einstein refuses to agree to. McCarthy eventually leaves only for Einstein to be interrupted by none another than Marilyn Monroe, who just happens to be filming The Seven Year Itch just down the road. If this set up already sounds farfetched then that’s because it’s supposed to. Terry Johnson’s play, written in 1982, is a fantastical dream play in which we watch Einstein, Monroe, McCarthy and Monroe’s then husband Joe DiMaggio collide with each other in a series of bizarre interactions. During these interactions we get meditations on science (Monroe at one point explains the theory of relativity to Einstein using a series of random objects), the nature of identify and the public fantasy of how a famous icon is perceived to be by the public and versus the reality of who they actually are. Of the four, Actors Simon Rouse does an excellent job as Einstein. His accent is perfect and throughout he is funny, deadpan and in the final scene, very moving. As Monroe, Alice Bailey Johnson also does an excellent job of portraying Monroe without resorting to clichéd mannerisms. She conveys the fierce intelligence that Monroe clearly had behind her façade. The set of the hotel room almost feels too big and could use more of a resemblance to the cloistered hotel rooms that existed in New York at that time. The sound design by Dinah Mullen is subtle and very effective. At certain moments we hear the distinct sound of a New York air conditioning unit, which actually adds tension to certain scenes. Overall, this is a very well acted production of what is a fascinating play. It’s like a cross between Neil Simon and Tom Stoppard. I recommend it. 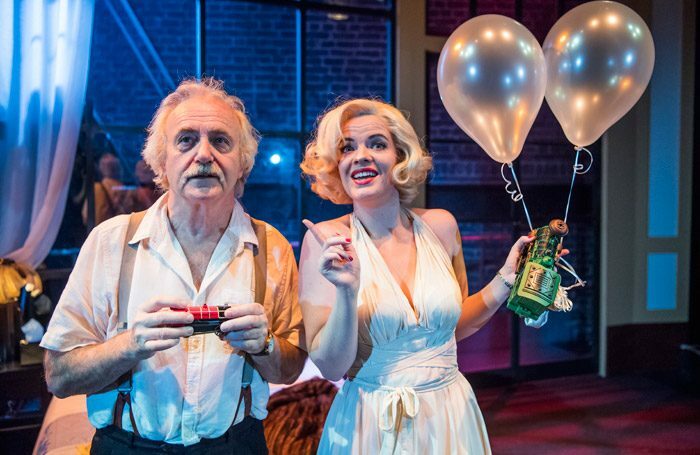 Insignificance runs through 18 November.